.....former Extreme drummer Mike Mangini has replaced Mike Portnoy in Dream Theater following a three-day audition process in New York. Portnoy quit the band last summer, but guitarist John Petrucci is thrilled with the new addition. He states, "The departure of our lifelong bandmate and friend was an unexpected and truly heartbreaking blow... but when we played with the infectiously positive powerhouse of a drummer that is Mike Mangini, we knew we had found a silver lining to what has been, by far, the most challenging episode in our musical lives." Singer James LaBrie adds, "I had the privilege of working with Mike on three of my solo albums, so I knew he would be a huge contender. He is without a doubt one of the most intelligent, intuitive, interpretive and virtuosic musicians I have ever played with." 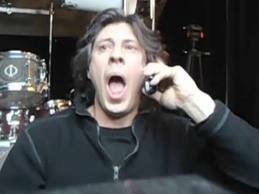 Mangini gets the news he's been waiting for !!! !